Power Pack 3.0 requires Review Board 2.5 or newer. Review Board 2.0 and older are no longer supported. Documents that contain pages and pages of text can be difficult to review, even more so as their authors continue to incorporate review feedback. Carefully flipping between revisions of a document and scanning for changes is time-consuming and error-prone. 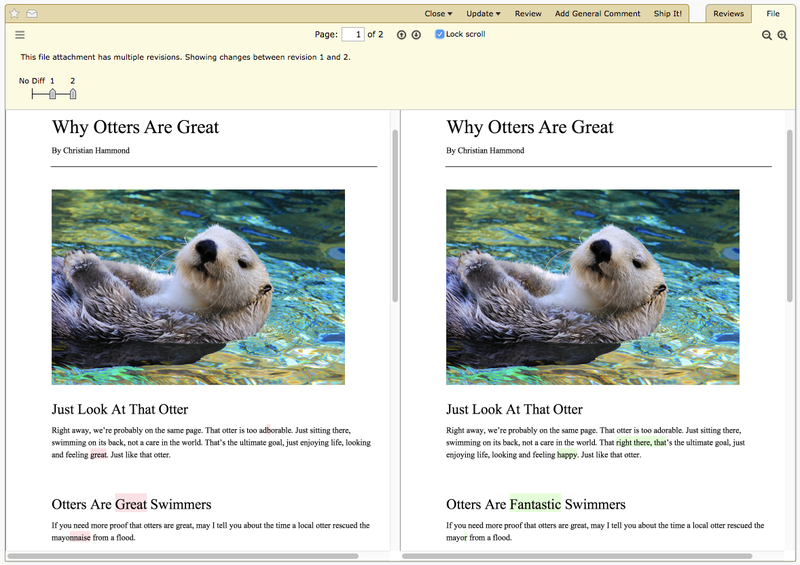 Power Pack 3.0 introduces the ability to view the differences between two revisions of a PDF document. When reviewing a document, select an older revision to compare to, and both documents will appear side-by-side with all changes to text highlighted within the document. A handy summary of those changes will also appear in the sidebar. To enable diffing of PDF documents, authors need to make sure to explicitly replace an older revision of a document with a newer one through the PDF’s file attachment thumbnail. Diffing will automatically be enabled. Please note that in order for Power Pack to highlight changes to text, the text must be able to be extracted from the document. Some PDFs, such as those generated by many scanners, only contain an image of the text but do not contain the text itself. Most applications, however, will generate this information. You can check if your document contains extractable text by opening it in a PDF viewer and attempting to either search for text or copy/paste lines of text. We’ve made it easier than ever to install a new license. When you’re issued a new or updated license, just open the Power Pack settings page to automatically check for a new license and install it. We’ve completely redone how the license information appears in the Power Pack settings page, giving you a better idea of the status of your subscription. This shows you how long until your license expires, whether you’re approaching your maximum number of seats, when your trial runs out, and more. Handy buttons are available to help you renew or upgrade your license, as well as to manage your subscription in our newly-rebuilt licensing portal. Fixed a crash that could occur sporadically when connecting to AWS CodeCommit. Fixed layout issues that could cause reports to appear slightly off-screen.